1. 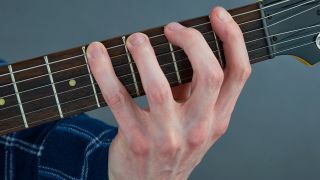 [Pictured top] Spread your fingers out so each plays one fret. It’s a one-finger-per-fret shape - and you can move it around the fretboard as you need to. 2. Play 1st fret, 2nd fret, 3rd fret, 4th fret on the sixth string. Either use hammer-ons, or, for a challenge, pick every note ‘down-up’ style. 3. Once you’ve played the pattern on the sixth string, move up through the other strings, then back down to the sixth string to start again. Finger permutations… The same exercise, but in a different order! We’ve played ‘1 2 3 4’ and ‘4 3 2 1’ finger patterns on our audio track, then dropped the guitar out for you to join in with any permutation you choose. We recommend playing at half-speed (or even slower) at first.